The first bullet mould I ever bought was a Lee. It’s a story every veteran bullet caster has heard dozens of times, “I’m just starting out and I don’t have much money. I want to get as much as I can out of the few dollars I have. How can I get started on a limited budget?” Like many other newby casters, I bought a Lee 6-cavity mould because they were lower priced than any of the other options I had at the time. I was fresh out of school and had my first real job and I wanted to get more actively involved in the shooting sports, especially competitive shooting, and that meant I needed to practice…..a lot. Casting my own bullets was the only way I was going to be able to hone the skills to the level that I was aiming for, and besides, it sounded like a lot of fun. That Lee 6-cavity wadcutter mould gave me a good start, and served me well for a number of years. Over the years, I’ve had a few Lee 2 cavity moulds, and generally speaking, I tend to favor Lee’s 6-cavity moulds over their 2-cavity moulds. This is because the 6-cavity moulds have true alignment pins and hardened steel bushings for the pins to mate with, and therefore tend to align better and last longer. The 2-cavity moulds are aligned by a couple of beveled cuts into the aluminum and a small diameter hardened steel rod laid into one of the mould block faces. When new, this system works OK, but there’s commonly enough free play in the mould blocks that this hardened steel rod doesn’t necessarily mate up perfectly with the recess in the opposite mould block. Thus, when the mould blocks are closed, the hardened steel can batter the edges of the aluminum recess, and slowly but surely the precision of the alignment starts to degrade. Eventually, this can impact the quality of bullets cast from these moulds. This is not a problem with the 6-cavity moulds, with their alignment pins and bushings. I have some Lee 6-cavity moulds (e.g. the 45-230-TC) that have cast untold thousands of bullets over the years and still produce quality bullets. Erik Ohlen at Hollow Point Bullet Mold Service (http://www.hollowpointmold.com/, erik@hollowpointmold.com, (541) 738-2479) offers a service for converting a customer’s mould to drop HP bullets. He does this in 3 different ways -- 1) a traditional HP with a manually removed HP pin, 2) a Cramer-style HP mould in which each cavity has its own captive HP pin, and 3) his very clever inset bar design, in which all of the HP pins are held captive in a single inset bar. 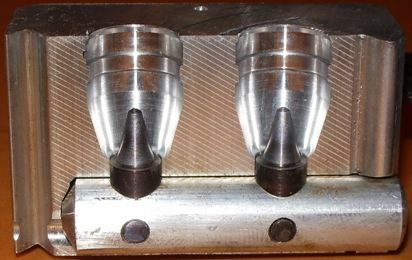 Both the Cramer-style and inset-bar HP moulds are compatible with multi-cavity HP moulds, and allow the bullet caster to cast bunch of HP’s in a short period of time (with a 2 cavity HP mould I can generally cast about 5-6 HP a minute, and with a 4-cavity HP mould I can generally cast about 9-10 HP’s a minute). All of these conversions are performed on customer supplied moulds. He has converted a number of moulds for me over the years and has done first-rate work in each and every case. Erik wanted to offer complete 2-cavity moulds for customers who wanted to get started casting HP bullets affordably. He chose to look at the Lee 2-cavity mould design a little more closely and see if he could meld the Lee 2-cavity mould design with his inset-bar concept to make a 2-cavity HP mould that would meet his performance expectations, as well as be affordable for his customers. Erik is a very clever guy. Looking at how the blocks aligned with one another, he realized that if he replaced the small diameter hardened steel rod used to align the mould blocks with a larger diameter rod (and obviously, a larger recess), that the blocks would align more smoothly and there would be significantly less battering of the edges of the aluminum channel. What’s more, if this round rod was aluminum (instead of steel), then there would be very little damage done to the aluminum recess at all. What’s more, he could use simple (and very affordable) aluminum round stock to make the inset-bar, and then use the transverse pins to anchor the HP pins into the inset-bar. To see how all of these parts fit together, please see the photo below (the charring seen on the inset bar is from the couple of drops of oil I placed on it while casting, this mould has cast well over 700 bullets). Erik offers a number of different Lee designs as pre-made 2-cavity HP moulds (for details see his website). I have long liked truncated cone (TC) designs for semi-automatic handguns as they tend to feed smoothly, have enough of a meplat to do a good job, and they tend to cast very easily. The 10mm is a round that has long interested me, so I placed an order for one of Erik’s conversions based on the Lee 401-175-TC mould. The mould showed up a little while later, and I immediately sat down and studied Erik’s design to see how he could do this so affordably. Things that need to be polished (i.e. HP pins) are polished, and things that don’t need to be polished (i.e. the inset-bar) are not. The execution of the design and function of the mould are very good. I fired up the lead pot and pre-warmed the mould. It took 15 or 20 casts to burn the oil out of the mould blocks, but then it started smoothly casting keepers every time. Bullets fell free from the blocks and pins effortlessly at about 5 or 6 per minute. I was casting with recovered range scrap (BHN of about 9-10) and bullets weighed 171 grains and were approximately .403” in diameter, and the tapered HP cavities were perfectly centered. Bullets were sized .400” and lubed with homemade Moly lube (1:1 beeswax/Moly grease). For bullets in this weight range in the 10mm, I have gotten good results with Acc. Arms #7 and HS-7, so that is where I started. I loaded these bullets into Winchester 10mm cases over 10.4 grains of AA #7, using CCI 350 primers (the Acc. Arms manual reports this load runs right around 1200 fps out of a 5“ gun) lightly taper crimped at an OAL of 1.240“. This load was test-fired in 3 different guns -- a 10” T/C Contender, a 6.5” S&W 610, and a 5” Colt Delta Elite. The scoped Contender put 10 shots into just under an inch -- clearly this bullet has significant potential. The 2 iron-sighted handguns ran a little over 2” for their 10 shot groups. The load was very clean in all 3 guns, with no leading, and it fed just fine in the Colt, but I felt that this bullet could do better accuracy-wise. 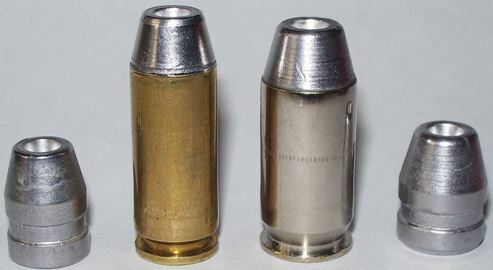 Similar tests were carried out using a load comprised of the 170 grain HP over 13.0 grains of Accurate Arms #9 (again ~1200 fps) with a CCI 350 primer revealed groups of less than an inch for the Contender, and 1 ½” for the S&W 610 and 1 ¾” for the Colt Delta Elite. That’s what I was looking for! This is an excellent load for the 10mm Auto cartridge. I haven’t done any expansion testing yet with this load, but previous experience with similar cast HP’s in the 10mm at these velocities has shown conclusively that expansion is positive. I would be comfortable hunting animals up to about 100 lbs (e.g. pronghorn antelope) with this bullet, and it would be very well suited for handgun hunting critters like Javelina and coyote. I haven’t done any longer range work with it yet, but I suspect that it should reach out nicely to ~100-125 yards, and varmint hunting for things like prairie dogs and jack rabbits should be a lot of fun with a load like this (I intend to find out this coming summer). When I was placing the order for the .40 cal mould, Erik let it slip that he was thinking about eventually adding the .45-230-TC to his 2-cavity HP line. The .45-230-TC has long been a favorite of mine for general purpose use in the .45 ACP, so I told him that I would like to buy one of the HP moulds, if/when one became available. A few weeks later, I got an email from him telling me to keep an eye on my mailbox, and sure enough a couple of days later the mould showed up. Once again, the pre-heated mould took about 15 or 20 casts to burn the oil out of the metal, and once again it started casting keepers time after time. The mould established a cadence for casting quickly, and bullets fell from the cavities/pins as soon as the inverted blocks were opened. I was casting with recovered range scrap (BHN of about 9-10), and bullets fell from the blocks at 222 grains and were a little over .453” in diameter. I was casting with this alloy because that is what I had in the lead pot at the time. This alloy is probably too hard to expand at .45 ACP velocities, but at this point I was primarily interested in seeing: 1) what the bullet weighed, 2) how concentric the HP cavity was, 3) how well the design fed in a 1911, and 4) how well this bullet grouped. I know from previous experience that for these bullets to expand in the .45 ACP, I will need to cast them from 25-1 alloy (or softer), and run them at 900-950 fps. Bullets were sized .452” and lubed with homemade Moly lube. I had my Dillon set up for target loads, so the first load assembled was a nice, easy mid-range load of 4.2 grains of Bullseye over a CCI 300 primer, loaded to an OAL of 1.165” with a light taper crimp (about 750-800 fps). This ammo was test-fired in a Kimber Classic Custom 1911 off of sandbags at 50 feet. This ammo fed very smoothly indeed, and 10-shot groups ran right around 2 ½”. While this is typical for many 1911’s, this particular gun is capable of better. Previously, I have seen cases of 1911’s that responded well to having the heavier cast bullets pushed harder than this (e.g. 900-950 fps), so the next batch of test loads were assembled using 7.0 grains of Unique and I was rewarded with 1 1/8” 5-shot groups. That’s more like it! Time to get the lead-pot fired up and get some of these bullets cast out of 25-1 alloy! In the field, this load would give devotees of the 1911 a good short range deer load (e.g. southern whitetails from a tree-stand in the woods), or something to go rootin’ around in the bushes after small hogs with (up to about 150-175 lbs). Obviously, this load would also be very effective for smaller vermin like ground hogs, jack rabbits, skunks, etc. I’ll be honest with you -- going into this project, based on my previous experience with Lee 2-cavity moulds, I wasn’t sure what to expect. But Erik Ohlen is a very clever craftsman, and he has come up with a way of not only converting Lee 2-cavity mould to drop quality HP bullets, but do so in such a way as to improve the mould alignment issues, and still keep things affordable. He offers several of the Lee designs on his website, and I chose two truncated cone designs because I had a couple of semi-auto loading projects underway, and I like the way truncated cones feed in semi-autos. 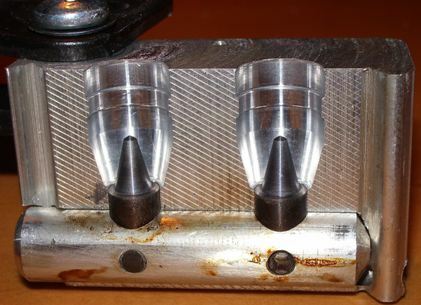 These 2-cavity HP moulds allow the bullet caster to cast a pile of quality HP’s in short order, allowing for lots of practice, and if desired, the assembly of some first-rate handgun hunting ammunition using homemade expanding bullets. That’s a heckuva deal!